Sour cherries are something I will one day try fresh. I've had sour cherry jam, sour cherry juice, sour cherry pie filling but I have never ever seen a fresh sour cherry. I'm sure they're available somewhere in Australia but that somewhere doesn't seem to be near me. This slice was originally a raspberry slice, so you could very easily turn it back into one if you have raspberries on hand. I didn't, so jarred cherries it was. There's nothing really wrong with jarred cherries in my view but, obviously, fresh everything is better. The cherries are one of my favourite fruits and yet cherry season somehow passed me by this year. The apricots did the same. Ordinarily summer would have been spent knee deep in apricots and yet I didn't have a single apricot between December and February. Where were all the apricots, I don't know! Summer is now over and autumn is definitely here so it's time to stop lamenting and get back to talking about slices. I've never really been a slice person, I make slices because other people like slice. Generally they're too sweet, or too dense, or the piece is too big, or too something else of me. This slice is nice, particularly when it's fresh. It's definitely best eaten the day it's made though it's okay the next day. I made my slice in a loose bottom fluted tart tin, unfortunately a few sections stuck at the sides making a bit of a mess. If I were to make this again I'd follow the recipes recommendations and use a straight sided pan. Grease the base and sides of a 20x30cm (8x12 inches) lamington pan. Line the base and long sides of the tin with baking paper, allowing the paper to extend 3cm (1 inch) over the long sides. Preheat the oven to 180°C (350°F). For the base, beat butter and sugar in the bowl of an electric mixer until light and fluffy, around 3 minutes. Add the egg and beat until well combined. Sift the flours over the butter, then stir until combined. With an offset spatula, spread the batter evenly over the base of the lined tin in a thin layer. Bake for 20 minutes or until light golden. Remove from oven and allow to cool in tin. Spread the cherry jam over the cooled base. For the topping, beat the butter and sugar until light and fluffy, add the egg and almond extract and beat until just combined. Add the buttermilk, combined sifted bicarbonate of soda, flour, and ground almonds and stir until smooth. Spoon the batter over the jam mixture in the pan. 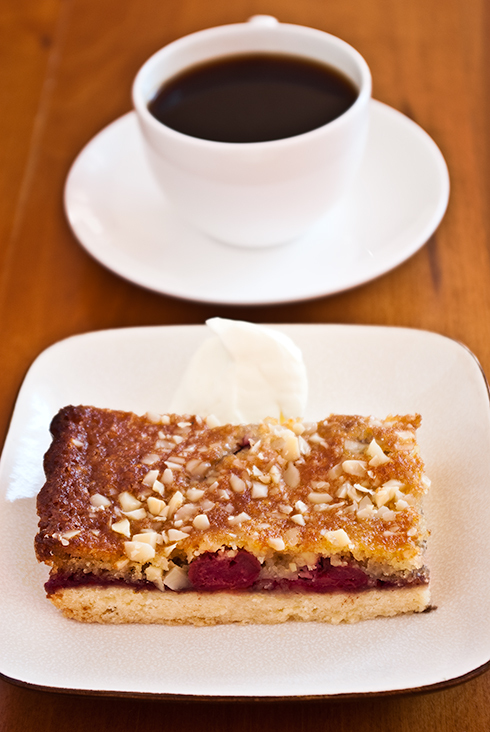 Place raspberries evenly over the batter then scatter with chopped almonds. Bake at 180°C (350°F) for 35-40 minutes or until the slice is golden and firm to touch. Cool in pan. Serve with whipped cream and coffee. This looks stunning. Its just the kind of thing I love with a nice cup of tea. I'm bookmarking this one. I'd love to wake up to that on a lazy Sunday morning. 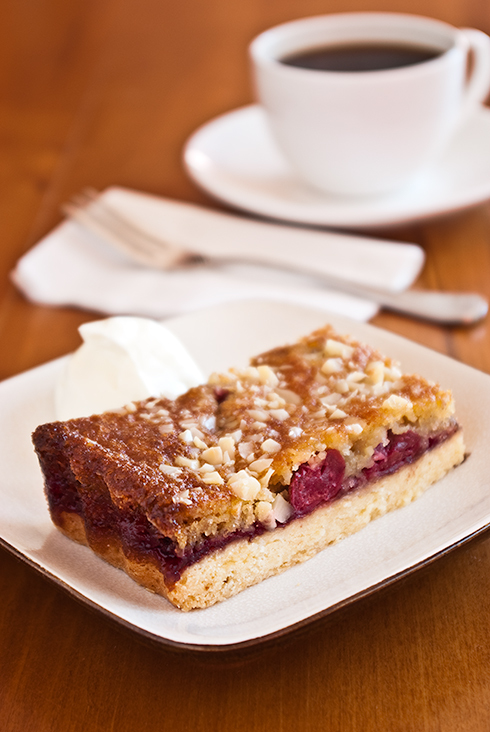 A strong cup of coffee, along with that ravishing slice, and you know the day just couldn't get any better. This sounds really good. They're really pretty, too!